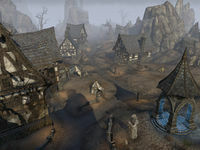 Hoarfrost Downs is a small town in central Rivenspire, east of Shornhelm. Hoarfrost Downs Objective: Help Captain Thayer enlist recruits for the Shornhelm Guard. The Wayward Son: Convince a young man to enlist in Shornhelm Guard. The Bandit: Help add a recruit to the Lion Guard. The Lover: Help recruit a reluctant lover to the Shornhelm Guard. The Price of Longevity: Solve the mystery of the strange sapling. 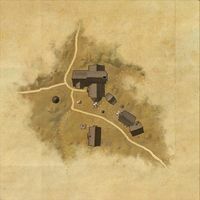 A Traitor's Tale: Figure out why Ranser's soldiers haunt the Tor. 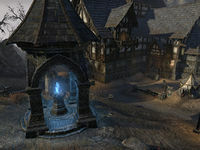 Hoarfrost Downs Wayshrine is located at the western end of the town, above the road to Shornhelm. This page was last modified on 19 November 2018, at 05:43.